Conveniently located off Interstate 24, this Baymont Inn and Suites Murfreesboro is in the heart of Tennessee near the Civil War Battlefield at Stones River, the replica pioneer town of Cannonsburgh Village, Middle Tennessee State University, Nashville Superspeedway, the Cheekwood Botanical garden and Museum of Art, the Grand Ole Opry, the Country Music Hall of Fame and Museum, Wild Horse Saloon, and restaurants. 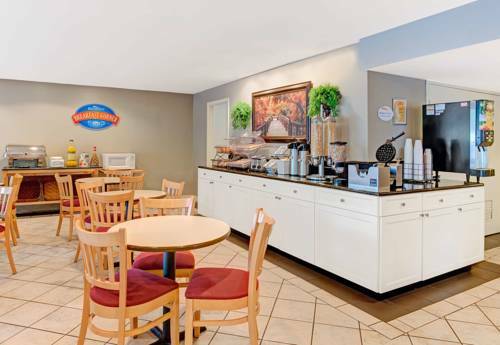 Experience hometown hospitality at this lodging with complimentary hot breakfast, complimentary Internet, gym, outdoor pool, meeting room and business center. There is no charge for children under 17 when staying with an adult. Guest room amenities include microwave, refrigerator, coffee maker and TV. Suites and non-smoking rooms are also available. Pets accepted for a fee of 15.00 per pet/per night. ADA defined service animals are also welcome at this hotel. Grave of the first world champion Tennessee Walking Horse, a breed originating with plantation owners and known for its calm manner and smooth gait. 224-foot-tall forerunner of the Saturn 5 moon rocket.